How to choose the right stand up paddle board to buy is no easy decision. There are so many factors to consider it can become a little bit overwhelming knowing where to begin. We’ve broken it down into the 5 questions everyone should ask when looking to buy a stand up paddle board. 2 Where Will You Be Paddle Boarding? 3 Who Will Be Paddling? 4 How Will You Transport and Store Your Paddle Board? 5 What’s Your Price Range? First of all, you have to ask yourself why you want to buy a paddle board. There are all sorts of recreational water toys you can buy so why go with an SUP? If you haven’t thought it through, here are a few reasons. For starters, it’s trendy. It’s only started rising in popularity over the past decade or so and is still climbing, so why not give it a shot? Compared to some other water activities, the barriers to entry are relatively low. SUPs are generally more lightweight than kayaks, for instance. Kayaks weigh between 40-100 pounds whereas paddle boards usually top out at about 40 pounds with most weighing between 25-35 pounds. Paddle boarding also requires less gear than a kiteboard or a windsurfer. You just put your board in the water and go, no complicated rigging systems to fuss with. And it’s an activity that most people can do with little to no prior experience or talent. Almost anyone can get going paddle boarding on their first day, if not their first attempt. 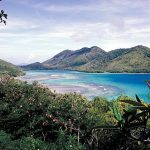 Kiteboarding and windsurfing are somewhat complicated sports that require lessons and gear know-how to get started and be good at it. All of these factors have combined to create a sport that is attractive to beginners who want a fun way to enjoy the water and get some exercise with minimal time, money, and hassle required. Where Will You Be Paddle Boarding? Once you’ve decided that you definitely want to give paddle boarding a go, the first question you must ask yourself when choosing a paddleboard is where will you be using it. Answering this question will be the prime factor in deciding what kind of board you go with. If you plan on using your board in a lake or other slow-moving water, you’ll want to look into an all-around or touring SUP. An all-around paddle board is just like the name says, a board that you can use in almost any body of water. These are good beginner boards because they are usually longer and wider and provide a stable platform to paddle from. Another way to look at an all-around paddleboard is to think of it like a “jack of all trades but master of none”. What you get in stability you might lose in speed or maneuverability. There’s always a trade-off somewhere. That being said, the ISLE 10’ 5” Versa stand up paddle board is their newest model and is designed to be the best all-around shape for fishing, paddling, or even yoga. If you want an all-around board not just for all waters but for all activities, the ISLE Versa is going to be a hard board to beat. Touring paddle boards are great if you’re looking to cover a lot of distance. They are slightly more narrow than an all-around board, which makes them more aerodynamic in the water. Touring boards glide across the water with a lot more ease than many all-around boards. If you’re going on a camping trip down the river, these will get you to your destination much faster than an all-around SUP. Or if you live near a large body of water and you want to explore more than 100 yards away from where you put in, a touring board will be the best bet for you. 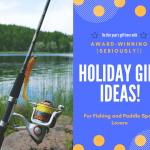 The right ones include deck space for storage of important safety gear and sustenance since you might be on the water for hours at a time and possibly not near a shoreline. BIC Sport ACE-TEC Wing stand up paddle board was Outside Magazine’s Gear of the Year Winner for Best SUP. Specializing in touring shapes, BIC offers two sizes of their ACE-TEC Wing boards and are at the top of their class for those looking for a touring SUP. For those who live near the coast and are looking for a board that can ride the waves, you’ll want to check into a surf SUP. These boards are going to be a little shorter and narrower than your all-around or touring SUP. Typically, they are not suited for beginners and are not versatile in use, although there are exceptions. Surf SUPs are shaped differently and have more rocker, or the curvature of the board from nose to tail (like a rocking chair), to help turn into powerful waves. You’re also going to have a more involved fin set-up. Touring and all-around paddle boards will usually only have a single, large fin at the tail end of the board. A surf SUP will have three or even four fins on the back and sides of the board to help with tight maneuvers and sharp turns. 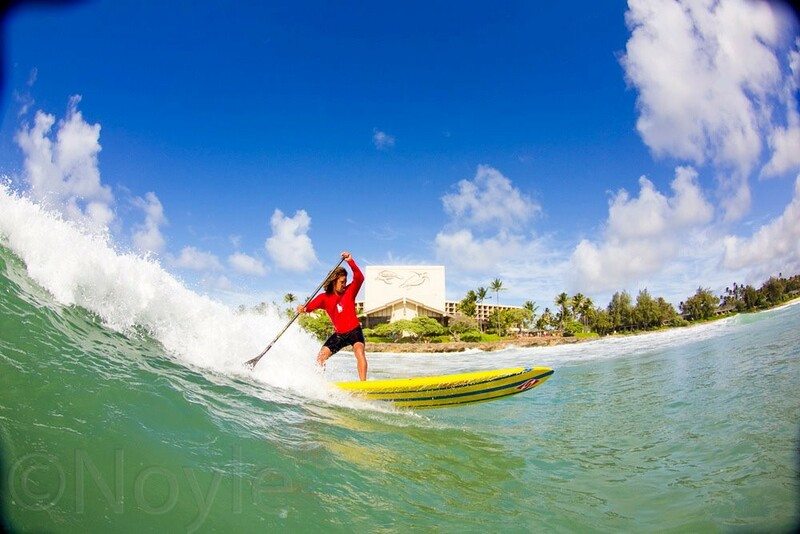 If you’re already an experienced surfer, why not go ahead and give paddle surfing a try? World-renowned board sports pioneer Robby Naish has made a name for himself in the shaping world now, too. His Naish Nalu GS is a starter surf SUP with just enough rocker to help you cut through the waves but also flat enough to still function as a flat water board. Now that we know the why and the where we now need to consider the ‘who’ of who this board is meant to suit. Is this board meant for a full-grown adult male? An average sized female? Kids and family? You and Cujo? A general rule of thumb is the bigger human you are, the bigger the board you are going to need. 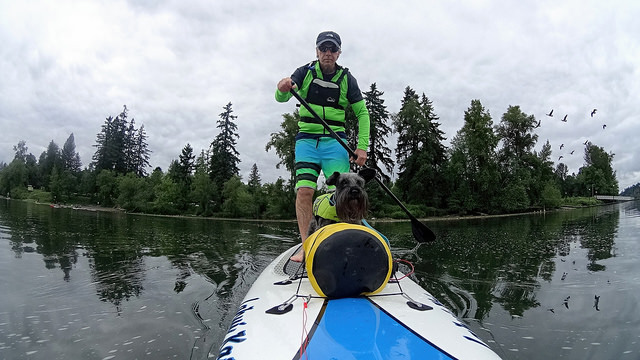 Not only will a bigger board provide added stability, some small boards are only rated up 200 lbs or less so they won’t adequately support a tall, muscular male figure or an average male who wants to take his 60-pound dog with him for a paddle. That being said, by comparison, what might be a small board for an average or above-average size male might be just right for an athletic, 150-pound female. Kids, additionally, don’t require the same massive sized boards as an adult male. In fact, too large of a board and the kids might find it difficult to paddle, especially against a strong wind or current. Thankfully, paddle board manufacturers are picking up on the fact that it’s not just men who want to paddle the water, but women and children as well. Some companies have started making smaller boards more suitable to this demographic such as the Newport Vessels Women’s Umami Stand Up Paddleboard. The Umami is an easy-to-transport 9’2” iSUP designed with women in mind. 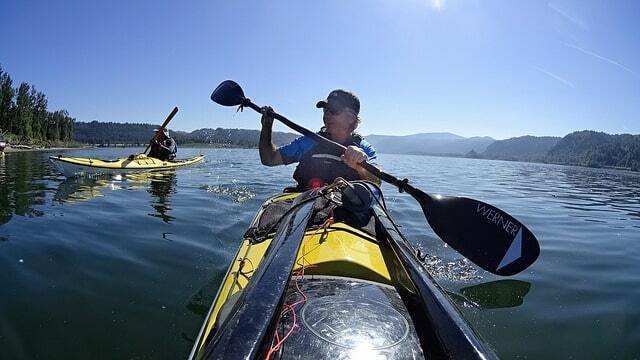 You can also attach a kayak seat to it to convert it to a sit-down kayak, which makes it a great versatile piece of equipment that women can use in a number of ways. How Will You Transport and Store Your Paddle Board? One of the final factors you’ll need to consider when choosing which paddle board to buy is where you’re going to store your board and how you’ll transport it to your preferred paddle spot. For many people, this is one of the biggest deterrents from buying an SUP. Due to their size and wide, awkward proportions, the thought of dealing with the hassle of carrying an SUP or loading it on top of a car, or maybe not even having a big enough vehicle to transport it, is enough for them to say, “no, thanks”. Fortunately, board manufacturers have come up with a number of innovative solutions to deal with this obstacle. 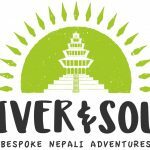 Nowadays there are all sorts of roof top carrying racks, wall racks, and SUP shoulder slings that make storing and transporting your SUP easier than ever. If you really just cringe at the thought of all that gear taking up precious real estate in your small space, you could always go the inflatable route. Inflatables are a really great choice for those who don’t want to worry about storing and transporting their gear for whatever reason. Lightweight and portable, most iSUPs deflate down to the size of a sleeping bag, are easily carried via backpacks and other carrying sacks often provided by the manufacturer, and can easily fit inside your trunk, apartment, or garage. Not only that but they are more durable than most of your typical paddle boards while maintaining a high level of performance. 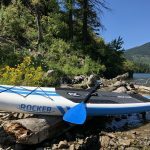 If you’re in the market for an inflatable paddle board, I already reviewed two of the best ones on the market which you can check out HERE. Last but certainly not least, price is obviously a huge factor when choosing a paddleboard. Paddle boards have a huge range in prices varying from as little as a few hundred dollars to almost $2,000 dollars! What accounts for this huge difference in prices? Construction materials, mainly. Inflatable boards are going to be your cheapest option. The drop-stitch construction typical of most paddle boards is fairly inexpensive, not to mention the diminutive size is also very cost-effective for manufacturers because it’s easier for them to ship and store them themselves. For your traditional boards, those are often made of an epoxy resin combination with a foam core construction. This has been a proven construction method for creating a lightweight, but strong and stiff board that can withstand use in a variety of conditions. Most of these boards start at around $650 and can get up to double that in price. Lastly are the carbon boards. Most carbon boards are going to be used for your racing or touring SUPs. Extremely lightweight, carbon SUPs are great for those who have a need for speed and performance at a high level. However, this supreme performance comes with a supreme price of between $1500-$2000, which make them more cost prohibitive to beginner paddle boarders. Not to mention that most carbon boards are made with experienced pros in mind due to their use in tournaments and racing events. If you’re an absolute beginner and really just want to try and get into the sport for as little as possible, I’ve done a nice write-up of the best cheap paddle boards on the market today which you can check out HERE. And there you have it! We’ve now gone through the who, what, where, why, and how of buying a paddle board. As for the when, how about RIGHT NOW by clicking this link to some of the amazing boards I’ve mentioned which you can find on Amazon at fabulous prices? Thanks for reading and PADDLE ON! It’s great to learn about different paddle boards. I love the idea of a surfing paddle board. Surfing has always looked fun to me, and this way I could have a paddle to help me stay up! Thanks for commenting! Yeah, paddle surfing can be lots of fun and a good way to ease into surfing. Just make sure you know the paddle surf etiquette before getting started. Taking a few lessons is probably the best way to get started. Paddle On!